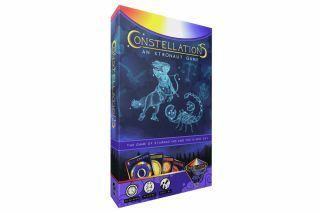 In Constellations, players compete to build patterns in the night sky using different types of stars. A new educational tabletop astronomy game has soared past its crowdfunding goal, and it should be available to purchase this October. The game, called Constellations, encourages children to learn about the mythical patterns in the night sky. The fundraising campaign nearly tripled its initial $15,000 goal on the crowdfunding website Kickstarter, finishing with $43,541. "We are excited by the overwhelming enthusiasm for our Constellations game," said Dante Lauretta, a co-producer of the game who also is principal investigator on NASA's OSIRIS-REx asteroid mission. "We managed to achieve all three of our stretch goals — thick-stock hex tiles for the constellations [similar to tiles in the game Settlers of Catan], glow-in-the-dark stars and three backer-exclusive constellation hexes," he told Space.com in an email after the campaign closed. "We will use the funds to pay for these upgrades in the game production costs and procure additional inventory," he added. "The game will be available for purchase this fall." Lauretta said the game will be released in October, but the group will encourage interested kids to participate in astronomy projects beforehand. For instance, one of the game's sponsors, Meade Instruments, is advertising a telescope that is safe to use during the total solar eclipse that will span the central United States this August. While planning Constellations, Lauretta tried to apply some lessons learned from the crowdfunding campaign and release of Xtronaut, the group's previous game about solar system exploration, which won several awards after a Kickstarter campaign in 2015. One of those lessons was to make sure that Constellations would be ready in time for the holiday buying season. Other members on the Constellations team include Ian Zang (lead designer), Mike Lyon (co-founder of Xtronaut) and Ashley Kenawell, who is illustrating the constellations. Lauretta served as scientific adviser on the game. Each copy of the game comes with a booklet explaining more about the types of stars, as well as other facets of basic astronomy. Lauretta said that Constellations doesn't make any mention of asteroids or his project OSIRIS-REx — a spacecraft that is flying to asteroid Bennu. However, he is working on another game about OSIRIS-REx that he hopes to release next year. The spacecraft will make its approach to Bennu starting in August.